One of the meals that was brought to us recently was a lasagna made by my friend Michele. 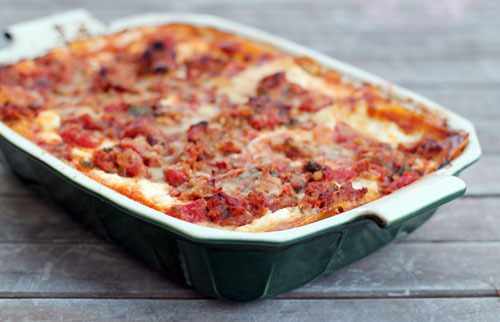 I think lasagna is a great meal to take to people who have just had a baby. You can cook it in a disposable container, it can easily be made with or without meat depending on the family, and it makes a ton of food. 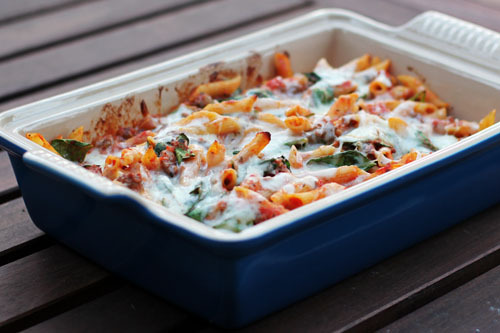 We received a lasagna when we had Cate years ago and ended up wrapping individual servings for the freezer, leaving us with several meals that we could spread out over time. Of course, that’s what I did this time around as well. It’s so helpful! And when the lasagna is AWESOME it’s even better. Michele used a recipe from Ina Garten, who we all know will never let you down! 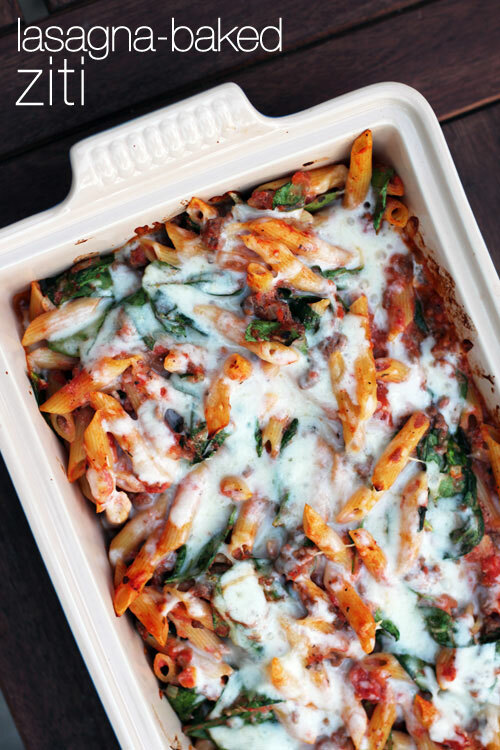 If you’re looking for a good lasagna recipe, this is it. Heat the olive oil in a large (10 to 12-inch) skillet. Add the onion and cook for 5 minutes over medium-low heat, until translucent. Add the garlic and cook for 1 more minute. Add the sausage and cook over medium-low heat, breaking it up with a fork, for 8 to 10 minutes, or until no longer pink. Add the tomatoes, tomato paste, 2 tablespoons of the parsley, the basil, 1½ teaspoons of the salt, and ½ teaspoon pepper. Simmer, uncovered, over medium-low heat, for 15 to 20 minutes, until thickened. In a medium bowl, combine the ricotta, goat cheese, 1 cup of Parmesan, the egg, the remaining 2 tablespoons of parsley, remaining ½ teaspoon salt, and ¼ teaspoon pepper. Set aside. Ladle ⅓ of the sauce into a 9 by 12 by 2-inch rectangular baking dish, spreading the sauce over the bottom of the dish. 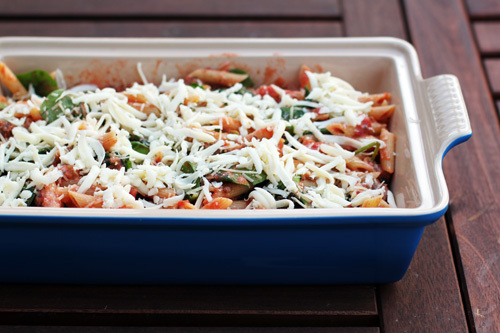 Then add the layers as follows: half the pasta, half the mozzarella, half the ricotta, and one ⅓ of the sauce. Add the rest of the pasta, mozzarella, ricotta, and finally, sauce. Sprinkle with ¼ cup of Parmesan. Bake for 30 minutes, until the sauce is bubbling. The original recipe is from Real Simple magazine, but it really is ”˜real simple’! Spread ⅓ of the sauce into a 9-by-13-inch baking dish. Layer 12 ravioli on top of the sauce. Lay the spinach (and pancetta and/or roasted veggies if using) and half the mozzarella on top of the ravioli. Add another layer of ravioli then top with the remaining sauce, the rest of the mozzarella, and the Parmesan cheese. Cover with foil and bake for 25 minutes. Uncover 5-10 more minutes, until bubbly.